An attractive yet reliable WordPress form plugin is an essential part of a successful website. An effective forms builder plugin enables you to engage with your visitors, encourage communication, set up subscription and payment forms, and lots more besides. So which WordPress forms plugin should you be using? In this article we will look at the top 10 WordPress form plugins that are available, and analyze their features and functionalities. By understanding what each plugin offers, it should be easy to choose a plugin that is a best fit with your site. Gravity Forms is a powerful tool, enabling you to build stylish, professional and advanced forms for your website. The Form Editor allows you to quickly create, configure and embed forms into your WordPress site. And with extensive features and customization options, you can produce a range of forms fit for purpose. Gravity Forms is premium plugin, and this is obvious in the support offered. Extensive documentation, FAQs and email support will ensure you can navigate this plugin with minimum fuss. Gravity Forms also offers basic and advanced add-ons, which are included with the business and developer plans. Ninja Forms is a favorite of mine as it is the contact form plugin that I use for my site. Use Ninja Forms to create not just contact forms, but email subscription forms, order forms, payment forms and lots more. There are no limitations on the number of forms you produce, the fields, emails, actions or submissions. Therefore, with Ninja Forms you can create forms to your exact specifications. Ninja Forms also has a complete library of add-ons. Premium add-ons like Campaign Monitor and PayPal Express will help you to increase form conversions and collect payments, amongst other things. Contact Form 7 is a free WordPress contact form plugin that you can install from the WordPress repository. With over a million downloads, it’s fair to say it is a popular and well established plugin. It allows you to create multiple contact forms on your site and customize them to suit your needs. The forms look professional, and are definitely inviting and user friendly. The downside to Contact Form 7 is that it isn’t the easiest option for creating custom forms. You do get a ready to use contact form after activating the plugin. However, there’s no drag and drop form builder to simplify the process of creating custom forms. The Contact Form 7 user interface could do with an upgrade. 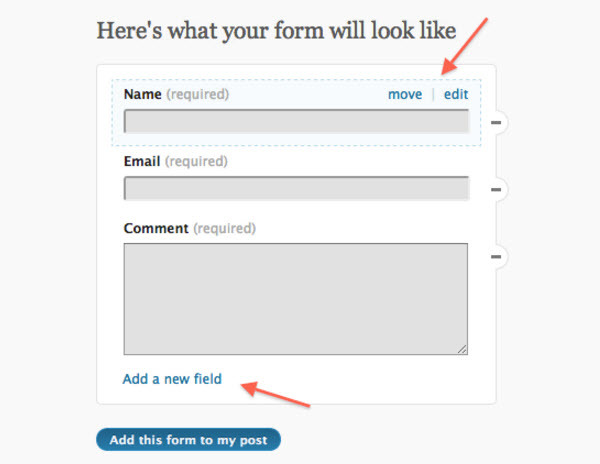 Formidable Forms is an innovative and easy to use WordPress form builder. Create powerful and professional forms in under two minutes. A simple drag and drop interface and a visual styler enables you to create powerful and professional forms quickly. Formidable Forms is customizable and extendable, with a full set of tools including field calculations and conditional logic. Add-ons are also available to help maximize what you can do with your forms. This plugin also offers world class support, whatever plan you purchase. 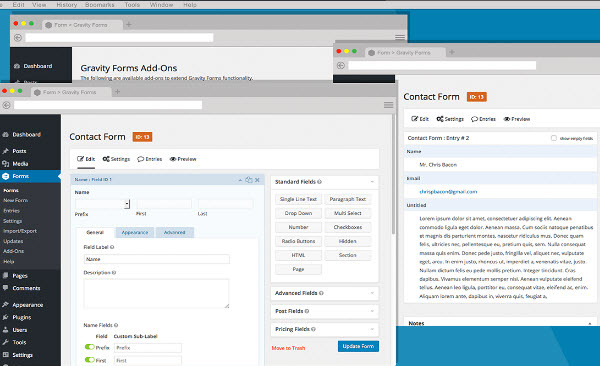 WPForms is a drag and drop online form builder allows you to create beautiful contact forms, subscription forms, payment forms and many more. Pre-built form templates make this plugin very beginner friendly as well as quick and easy to use. WPForms prides itself in producing responsive, SEO and speed optimized forms, that can be embedded into any page on your site. WPForms is available in a free Lite, and Premium version. Check out the advanced features and functionalities to decide which option is for you. Visual Form Builder will enable you to create attractive, eye catching forms. Building a fully functioning contact form with this plugin only takes minutes, and no writing of code, or coding knowledge, is needed. However, the features included with Visual Form Builder are more for a beginner site, unless you choose to upgrade to Visual Form Builder Pro. The Pro version of this plugin is a powerful and flexible tool. Access numerous form fields to build effective forms. 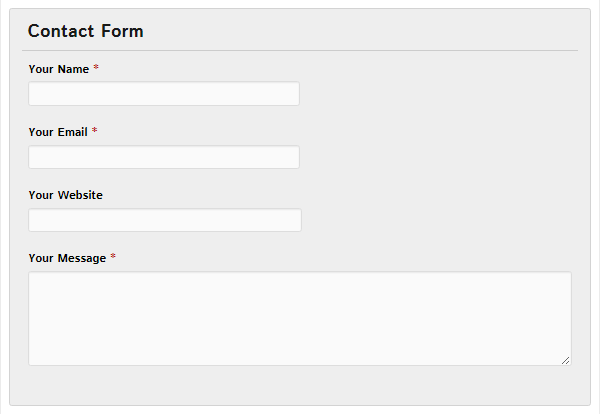 Fully customize your form’s appearance using the Email Designer. Add-ons are also available with the advanced plans to extend the plugin’s functionality, if needed. Pirate Forms helps you to create an engaging contact form for your website. Extremely easy to set up, simply use a shortcode where you want a contact form to be displayed. Customize by selecting which fields and messages will be shown on your forms. Pirate Forms provides reCaptcha, ensuring the emails are addressed to you and you aren’t bothered with spam. An SMTP option is also offered, sending email directly to your personal email. This helps you keep in touch with your customers and makes sure you won’t miss any important emails. Jetpack Forms, part of the Jetpack suite of plugins, is a free way of adding stylish forms to your WordPress site. As with all the Jetpack options, Jetpack Forms is intuitive to use and very straightforward and quick to set up. Add contact forms to posts, pages or widgets, although bear in mind that you can only add one form per page. Customize a form by altering the fields displayed and the subject settings. Further changes to a form can be made using CSS. Clear details on how to set up a Jetpack contact form are available on their website. Fast Secure Contact Form is another free WordPress form plugin. This powerful form builder lets you easily create and add forms to your website. Effortlessly produce, edit and add multiple forms, using the drag and drop interface. Then customize with CSS to match your forms with your brand. Fast Secure Contact Form can also be used with vCita, an online scheduling software. This will enable you to create online scheduling, appointment booking and free invoicing. Add an online scheduling button to your form, display your availability and invite clients to book an appointment, all online on your site. Contact Form by BestWebSoft is a simple WordPress contact form plugin. Forms can be added via a shortcode to any page post or widget. Field labels can be edited and reordered using a drag and drop interface. And Captcha or Google reCaptcha is used to help protect from spam. Best Web Soft also offer a pro contact form option. This includes extra features and customizations that more advanced websites may deem necessary. As you can see there are numerous WordPress form plugins available. Some have more basic features and functionalities, others are more advanced. Take into account your level of WordPress experience, your budget, and your site’s needs, then make a choice accordingly. Would be cool if you guys could focus on writing about the latest WordPress themes again. Hi Luca, thanks for your comment. I’m not sure if many people are interested in our posts about the latest WordPress themes, but nice to know at least one person is. Hi, what about Visual Builder for Contact Form 7? Thanks for sharing the form builder plugins. I’ve used Form 7 plugin it’s bit heavy plugin but this is one of the best form builder plugin I’d recommend. Other plugins are good too but I’d suggest use your themes forms if your theme provider have form page. If not then use these plugins. I’m not a big fan of form plugins that’s why I always suggest my readers to use their own forms. 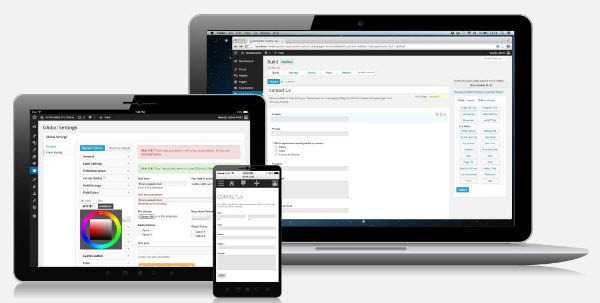 Gravity Forms is the Easiest Tool to Create Advanced Forms for Your WordPress Powered Website. Over A Million WordPress Sites Are Already Using Gravity Forms. I used contact form 7 on my website. Thank you for sharing this contact forms with us. It helps me a lot.